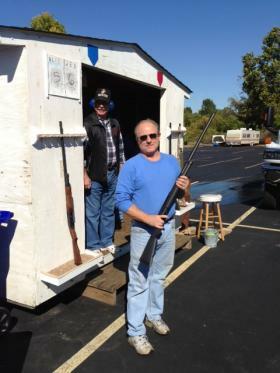 Elks Lodge 2316 holds meat shoots each Sunday in the autumn. The last to be held this season will be Sunday. Maria Altman reports on the tradition of the "meat shoot." The first thing you need to know about a meat shoot is that they don’t shoot animals. Lakas sits at a long table outside Elks Lodge 2316 in Florissant with a cash box in front of her. The wife of one of the members, she’s signing up shooters at $3 per round. Most of the money will go to the Elks’ charitable work, but the winners will walk away with meat; a different cut for each of up to 30 rounds. An announcer calls out that Round One is beginning. It’s noon and the shooting will go on until dusk. Gunshots pierce the air about every 30 seconds during each round, and the 12-gauge shotguns are loud. 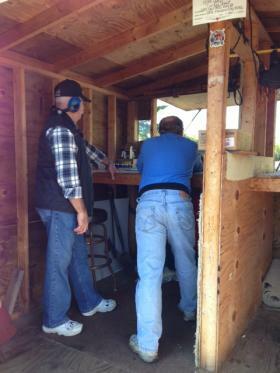 When their name is called participants step into a sort of hut and take aim at a 5x5 inch white card about 60 feet away. Whoever hits closest to the black dot in the middle of their card wins the round. Mark Knight says last year he won so many times others asked to use his gun. He leans against his truck with his gun resting open tailgate. He says he’s been coming here for about five years, mostly to hang out with friends and enjoy some shooting without leaving the city. I ask him how he got into meat shoots in the first place. This Elks Lodge is only 10 minutes from Knight’s home, he says. And there are lots of other shoots in around the area in both Missouri and southern Illinois. Yet, the shoots are not unique to this region. “Most of the ones up here in Ohio are called Turkey Shoots,” says Linda Tubbs. She and her husband, Denny, run Turkeyshoot.net out of their home in Marion, Ohio. After traveling to shoots in several states, the couple decided to start their website for fun and list as many of the events as they could find. Soon, she says, people were calling them and giving them information. Tubbs says rules vary from place to place, but generally shoots use shotguns, paper targets and winners take home some cut of meat. At Elks Lodge 2316, Don Motzkus is the one who decides who the winner of each round is. He’s had the job for six years and says shooters rarely question his decisions, although once in a while someone will jokingly offer him money. When the call is close Motzkus uses a jeweler’s loupe to determine whose shot takes up most of the black center dot. He described the tool as the thing you see on TV when people look at diamonds. In the seventh round he finds Mark Knight just falls short of another shooter. Knight shakes his head in disbelief. Knight takes the loss philosophically. He says there’s always next week. 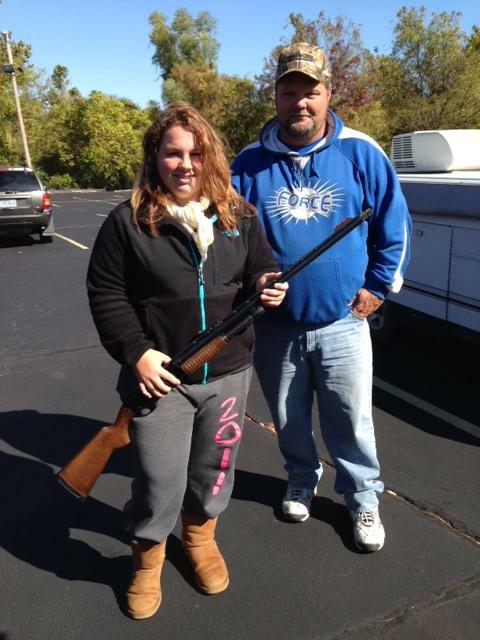 Doug Wilson and his daughter Mackenzie talk about their "shoot off" at the meat shoot. Copyright 2013 KWMU-FM. To see more, visit http://www.stlpublicradio.org.